Finding the best insoles for plantar fasciitis is in fact a really difficult task as you have to go through a wide variety of these insoles available in the market. 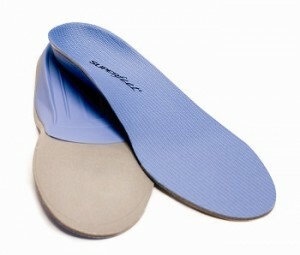 If you are on your feet all day then insoles more commonly known as orthotics should be an essential part of your life. They have a lot of advantages associated with them. What can Insoles do for your feet? Nobody wants to end up buying the wrong kind of orthotics or those that worked for some time and were then of no use. In order to make the right decision, knowledge of some of the features of the good insoles for plantar fasciitis is crucial. Reputation is the key. If a certain orthotic is not used by plantar fasciitis sufferers or if it was unable to do the job for them, then you might as well refrain from buying it. Look for insoles that might actually do something for your feet. You can do so by checking the brand you are interested in and whether or not that company makes insoles for plantar fasciitis. They must offer strong arch support. Lastly, best insoles are the ones that are according to your specific condition that is supination or over-pronation. It takes time to get used to adapt to the added arch support and thus a few days are needed until the orthotics can be useful and effective. Some orthotics can be fairly out of your range in terms of money. They are way too expensive and a better alternative is to buy new shoes. There is usually a chance that the insoles will not remain for a longer period of time. The reason can be that they are directly in contact with your feet all day long and can thus break down quickly. What does Research say about Insoles? Advising plantar fasciitis sufferers to buy orthotics for relieving their pain is a common practice amongst podiatrist and other health practitioners. A study found that as compared to the custom orthotic inserts common pre-fabricated ones were able to out-perform and were beneficial as an initial treatment. Another study concluded that foot orthoses were able to reduce foot pain significantly and the foot function was increased after only 4 weeks amongst the group which was required to wear functional orthotics. 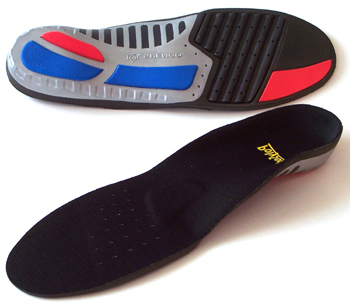 We have reviewed top 5 insoles for plantar fasciitis for casual shoes. Our reviews include the highlighting features, pros and cons of these 5 insoles. 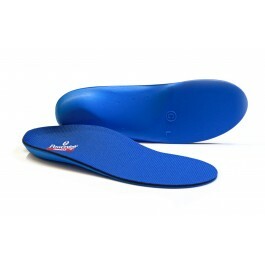 Superfeet Blue insoles are considered to be the best in the market. Their ADD/APT System gives a 3-dimensional feel to your foot. These insoles are podiatric designed and their structure gives maximum support and comfort to your feet. 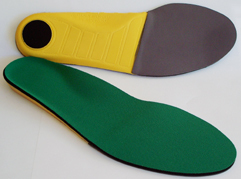 These insoles consist of a heel cup, rear foot support, firm foam layer and stabilizer cap. Pros – Recommended and loved by many plantar fasciitis sufferers and helps in relieving the pain, Durable, Suitable for a variety of shoes and are best for flat feet. Cons – Expensive, Requires Break-In and Size inconsistencies. Although Superfeet wins when it comes to insoles for plantar fasciitis, but the second best that you can find in the market is one from Powerstep. Powerstep Pinnacle is made up of Polypropylene anti-bacterial ETC fabric. It has a heel cup for feet stabilization and double-layer cushioning. This full-length polypropylene orthotic is another great one from Powerstep. It features Poron® heel Comfort Cushion that provides support and cushioning to your feet. It comes in a variety of sizes and is available for both men and women. If you are on your feet the whole day and you suffer from plantar fasciitis then Syono Orthotics Gel Insoles and Shoe Inserts are what you need. These inserts are made to provide comfort, support and cushioning to your ankle, heels and your body in general. They come over-sized so that you can alter them according to your needs. Polysorb Total Support insoles from Spenco are one of their top guns as they include 3-PODTM Cushioning System which works great for shock absorption. These are primarily made for people who over-pronate. They have heat moldable layer and forefoot crash pad for maximum support and cushioning. Cons – Might not offer adequate arch support and is also not suitable for wide feet. 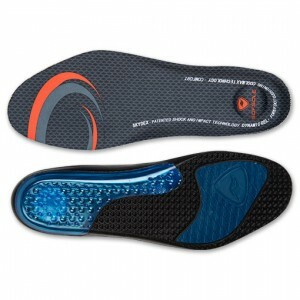 Designed by a Doctor, these insoles are one of the best when it comes to the good insoles for plantar fasciitis. They have 3 main highlighting features. Ball of foot padding for maximum cushioning, arch area is reinforced for better support to your feet and a deep heel cup for greater shock absorption. Spenco Polysorb Cross Trainer inserts have some unique features like Eva forefoot cushion and Spencore heel plug that helps in providing cushion and support to your feet. They are made up of polysorb polyurethane foam and have a 5/32 inch thick layer of Spencore material that works as a shock-absorbent. Its 4-way stretch fabric with silpure antimicrobial keeps your feet odor-free and prevents any blisters from forming on your feet. 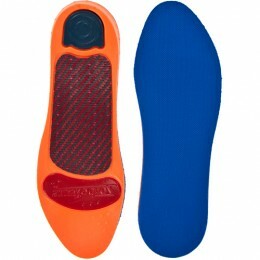 Sorbothane claims that these Graphits Arch Insoles are energy core metatarsal inserts that absorb 94.7% of the shock or impact we create while walking and thus they ensure smooth gait throughout the day. Combined with the polyurethane layer, the graphite arch delivers great arch and heel support and cushioning. It also has a poron foam layer that serves as an extra shock-absorbent. As the name suggest, Sof Sole Air Insoles include air chambers paired with the polymer gel in the arch and heel area which offers support, cushioning, shock absorptions and endures the impact of tough activities. It also has a nylon plate that prevents the exaggeration of your plantar fasciitis pain and keeps your feet in their right position. Pros – Decrease plantar fasciitis pain, keeps your feet cushioned and comfortable, effective during running. Cons – New design is slimmer as compared to its ancestors, might have inconsistent sizing. 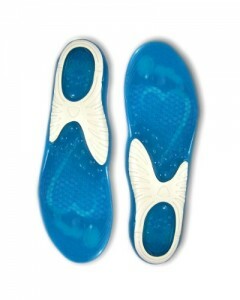 The above mentioned insoles are our favorites amongst the large variety available in the market. We suggest you to make your choice from these perfect insoles for plantar fasciitis. We hope that up till now you have got the hold on to the type of foot condition you have, your footprint and other useful information required for making the right choice. You should be assured that these 9 insoles are the best as these are tested and loved by their users. To end our discussion, we would recommend you to buy a high quality insert as soon as possible so that your feet are relieved of the plantar fasciitis pain.